Javelin® DNA offers an all in one solution with high quality colour or monochrome printing for single sided to dual sided field upgrade option. 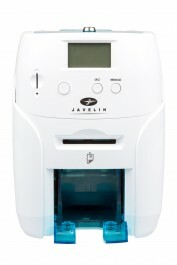 The Javelin® DNA pro series is our NEW generation of feature rich desktop ID card printers. This compact and powerful model is user-friendly and delivers outstanding performance at a great price. The Javelin® DNA Pro series offers an all in one solution with high quality colour or monochrome printing. Our new upgrade options include dual sided printing, Wi-Fi, security locks, additional hopper and encoding modules. The Javelin DNA Pro is an entry level manual and which has input and output hoppers (auto feed). The printer have LCD display for ease of use. The Javelin DNA Pro comes with a 30 months printer warranty ! Ideal for Staff ID, School ID, Visitor ID, Student ID, Membership Cards, Loyalty Cards, Photo ID, Plastic ID, Events Passes, Contractor Passes, Driving Licences, ID Permits, Identification Cards, Business Cards, Hotel Cards, Access ID plus many more applications.